The most diverse range of vehicles at our event, ever (since 2011). We had 6 vehicles available for test drives, with the Honda Clarity our newest addition to test drive events. A Jaguar i-Pace was a last-minute addition and highlight for those looking at higher end EVs. Georgia Power hosted a photo booth to engage participants. 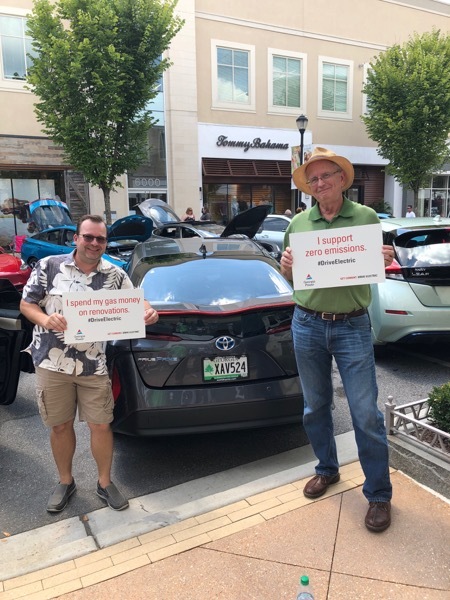 EV Club of the South members tout reasons to drive electric! The Atlanta Metro National Drive Electric Week event will be held on Saturday September 8, 2018 at Avalon in Alpharetta. The event will bring EV drivers and enthusiasts together to highlight the fun, clean-air benefits, and cost-savings of electric cars. This will be our third year at Avalon and we plan to make it bigger and better than last year at Avalon. We will have room on Avalon Boulevard for displaying approximately 50 plug-in electric vehicles. We will work with the local PEV dealers to provide vehicles for a ride and drive during the event. As in past years, the EV Club of the South, Clean Cities-Georgia, and the Southern Alliance for Clean Energy will host the event with sponsorship from Georgia Power, Nissan and others. There are currently 211 attendees registered. Registered attendees report 1,334,909 electric miles driven.